I’ve already talked about the general pros and cons of credit cards, but now let’s look at some of the positive and negative attributes of individual card issuers and their related credit cards. When I think about American Express, I think convenience. They truly have the best customer service out there, which can be quite poor in the credit card industry. They take care of things quickly and efficiently, making them my go-to credit card issuer. It’s easy to dispute charges and there’s never a wait to get a live representative on the phone. They also provide large lines of credit, which is always a plus for the responsible cardholder. 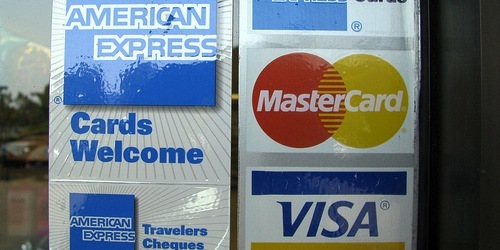 The only drawback with American Express is the fact that not all merchants accept their cards. In fact, it’s relatively common to encounter a merchant who will not accept American Express as a payment option. This is partially because Amex charges higher transaction fees, and also because they tend to side with cardholders over merchants in the event of a dispute. Many of their credit cards are actually charge cards too, meaning payment must be made in full each month. But the best cash back credit card out there happens to be an American Express credit card. The old Amex Blue Cash to be exact. If you’re big on Membership Rewards points, as opposed to cash back, check out the Amex EveryDay card or the Amex Platinum card. At last glance, they were the largest credit card issuer in the world thanks to their acquisition of MBNA, and their strong presence in many countries worldwide. In terms of U.S.-based cards, they don’t offer anything particularly groundbreaking, though I do carry their BankAmericard Cash Rewards Credit Card. It features a 3-2-1 rewards structure for gas, groceries, and everything else, respectively, which is decent, but you need to earn at least $25 to redeem it. They’ve also got some travel rewards cards, including the MERRILL+ Visa Signature card, which offers a 50k-point sign-up bonus and attractive redemption options (25k points for a $500 flight). But none of their cards will blow your mind or change the game. They’re just run-of-the-mill, decent cards that might find their way into your wallet. I will add that they seem to be generous with credit limits and aren’t too difficult to get approved for. Additionally, their cash back offers are a nice touch, often giving you 10% off at places you shop at nearby, such as Whole Foods, Starbucks, and so on. Last on my list (in terms of favorites) is Barclaycard, which is backed by a large British bank by the name of Barclays. They’ve been easing into the States recently with a number of different credit cards. They’ve certainly got some unique offerings, including the first-ever crowd-sourced credit card called Barclaycard Ring. Its terms are essentially influenced by cardholders, so if everyone gets together and asks for X, the company may oblige, within reason of course. They’ve also got some travel rewards cards, such as the Barclaycard Arrival Plus, though I will say that they haven’t wowed me with their points system or initial bonuses. However, the Priceline Rewards Visa is backed by Barclaycard, and it appears to be a winner for frequent Priceline users. I enjoyed the opening bonus on the Arrival Plus card, and felt it was easy to redeem points. But they’ve since made the card less attractive, and they seem to be very picky about approvals. In fact, they’ll often make cumbersome paperwork requests, asking for all types of documents to be mailed to them in Delaware just to approve you, even if you have a solid credit history and stellar income. For that reason, they’re one of my least favorite issuers, though they do still have good deals here and there, frustratingly. The one major benefit of a Capital One credit card is the lack of an international transaction fee. This is a huge selling point if you travel outside the United States often, as the foreign conversion fee charged by all other card issuers can get quite expensive. Their card lab is also helpful, as you can select exactly what you need/want, without settling for a generic credit card. On the downside, the customer service at Capital One is known to be quite poor. When I received a credit card from them, it didn’t even contain important information related to my specific card. Things like the purchase and balance transfer APR, fees, or how long I had introductory 0% APR were all left out. I had to call their customer service department to ensure the terms I agreed to when I signed up for the card were actually what I received. That’s inexcusable to me. One of their most popular cards is the Venture Rewards credit card, which offers 2X miles on all purchases that can be redeemed for travel. Chase credit cards have a great rewards programs, including good cash back benefits. And amazing upfront bonuses via their Chase Sapphire Reserve and Chase Ink cards. Their Freedom Card comes with 5% cash back in categories that rotate, meaning it’s a card you should have in your wallet for those months where the categories line up with your spending habits. They’ve also had pretty good balance transfer offers in the past as well and presently, including the Chase Slate No Fee offer. Their website is user-friendly, making it easy to complete a number of tasks like change of address or credit line increases. Credit lines tend to be large to begin with and their Ultimate Rewards are very flexible. A negative at Chase is the 5/24 rule, which limits how many credit cards you can get approved for. This kind of solidifies their top ranking in the credit card industry…the fact that they have to limit you. Citi has some of the best credit cards offers around, although some of their most sought after deals, like no fee balance transfer credit cards, have all but disappeared. They tend to have the greatest range of credit card options available, such as the longest 0% APR periods of any credit card issuer. They’ve also got a great interface on their website, making it easy to execute balance transfers and take care of other account duties. Popular offerings from Citi include the Citi Prestige card and the Citi ThankYou Premier, both of which now allow points transfers to airline and hotel partners. Customer service is also pretty solid, and they tend to have American reps at their call centers. However, they aren’t great about matching bonus offers like Chase. The negative is that most of their hot offers aren’t so golden anymore, but always consider Citi in your credit card search because they tend to get pretty good promotions every now and again, and are generally easy to get approved for. Discover is a less widely used credit card, but comes with some good benefits. Namely, their 1% cash back on all purchases, which has been a big draw for years now; of course, most other card issuers offer similar,if not better, rewards cards nowadays as well. Their it Card also offers 5% cash back quarterly specials for certain expenditures, making it beneficial to hold on to for those particular purchases. Their most recent offering is the Discover it Miles, which comes with unlimited 3% cash back for the entire first year of cardmembership. Not a bad deal, and one I took advantage of in conjunction with their Apple Pay promotion. Like American Express, Discover isn’t accepted by all merchants. In fact, I would venture to say fewer merchants accept Discover than Amex, though I could be wrong. The good news is redemptions for cash back have no minimum, so you’ll never be stuck with odd amounts in your account. A relative newcomer on the main stage is U.S. Bank, which began offering some unique credit cards over the past few years. They’ve got one cash back credit card that allows you to pick your own categories, instead of fussing with the rotating categories you can’t control. And another card that offers 0% APR for 15 months. Recently, they partnered with American Express to offer a new line of “FlexPerks” credit cards that allow you to earn FlexPoints, which are good for bonus travel redemption. Finally, we have Wells Fargo, which recently made a more determined effort to get into credit cards via their Propel World card from Amex. But it seemed as soon as they arrived, they were on the way out. They’ve since shuffled their offerings and never really had anything that exciting to begin with. My guess is Wells Fargo is going back to the drawing board here. Aside from these big names, there are many other smaller credit card companies out there that may provide benefits the big guys don’t or won’t touch. So be sure to check out what your local bank or credit union is offering as well.